"They will break upon this fortress like water on rock. Saruman’s hoards will pillage and burn, we’ve seen it before. Crops can be resown. Homes rebuilt." I’ve been making cards for about a year now. It’s the kind of thing you can do when you’re down – I love putting on films in the background while I make them. At the moment I’m in Christmas card mode (so much so in fact that I forgot to make Dad’s birthday card!) and, as I’m sending cards to my fellow Ulmoites, I’m trying to give them a Middle-Earth theme. And it isn’t necessarily all that easy. Before I start, there’s a basic kit that every card-maker needs, or at least can find very useful. Paper – for some reason it’s often easiest to get different colours of paper rather than card, so I also have a lot of this. If you want to get fancy you can also use paper to put inside your cards as an extra insert, which gives quite a classy feel to it. You can also buy some really unique kinds of paper for special cards! When I moved into my new house I wanted to give my new housemates cards. 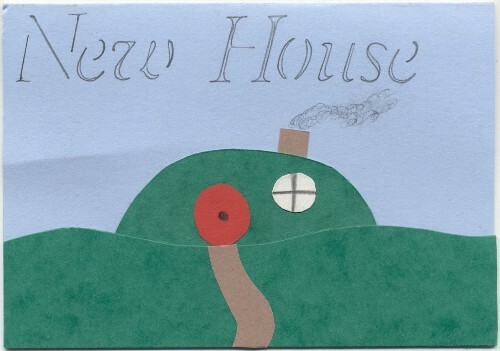 As one of them is a LOTR fan I thought I’d make it a bit more interesting, and decided to make a card with a hobbit-hole rather than an ordinary house. So I collected my green card together and got to work to produce this. Unless you want to physically draw on Christmas crackers and add trees to images, it can be difficult to make cards that are both Middle-Earthy and Christmassy. 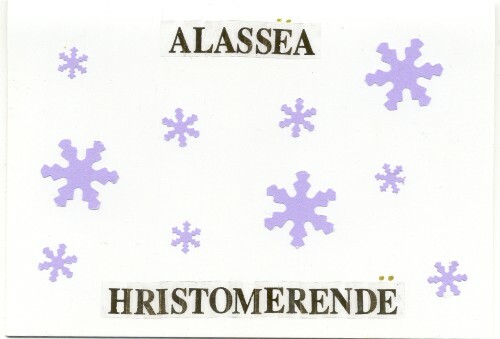 The easiest way is to use Elvish text (which you can either do by printing onto the card or by copying the letters). Some of my cards are very simplistic, with just writing and a few stars, and so this is the perfect way to do that. Even better, you can actually use the language – according to the Stockholm Tolkien Society’s research, ‘merry Christmas’ can be translated into Quenya as ‘Ná merye i turuhalmeri!’, and Planet-Tolkien gives it as ‘Isusarad ‘elir’. But I think I’ll stick with the ones given on CoE myself: ‘Mereth Veren e-Doled Eruion!’ in Sindarin and ‘Alassëa Hristomerendë!’ in Quenya. My favourite ways for creating text are by using stickers, but with longer sentences this can get quite expensive (which makes that Quenya translation even more attractive! ), or with stamps. My alphabet stamps are really good for this, but it can be tricky making sure they look neat – it takes a lot of care. Stars can be drawn, stamped, punched or simply stuck on, and can be both simplistic and elegant. There are other ways too. 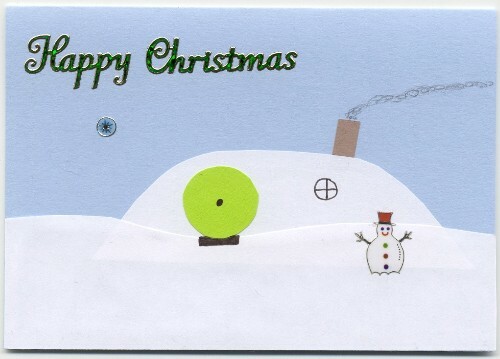 One of my favourites is simply to adapt the hobbit-hole card, by using white card instead of green to indicate snow, and maybe adding a Christmas tree or a snowman. You can also just use Elvish-style images – tall archways with a Christmas tree in the centre for example. Of course if you did actually want to use images from the film (and I’ll re-emphasise the need for a good photo-quality printer here) you could easily use something from Caradhras, or a picture from a party. The perfect LOTR scene for birthdays is of course Bilbo’s party, and with that in mind it’s always worth considering using that fantastic banner they have in the film, although of course it does say in rather large letters ‘Bilbo Baggins’! Any images from that party can be used to, although I don’t usually do that. I’m more likely to try and copy the text of the banner and just use ordinary birthday pictures, such as cakes and presents. I either use stickers or cut out my own shapes, stickers of course being the easier option. If you’re going for an Elvish theme, you can use the phrases given on CoE to say ‘Happy Birthday’: the Sindarin ‘Edinor veren!’ or the Quenya ‘Alassëa nosta!’. As you can see, it isn’t necessarily all that easy to make cards in a Lord of the Rings style, but it certainly can be done. If you have any other ideas, I’d love to hear from you – in the meantime I’ll keep on experimenting and hoping my ideas work out okay, and if I think of any other ways (or indeed occasions) I’ll add them later.